Seoul takes its summer holiday this weekend so Busan moves to Saturday and Sunday. Wonder Bolt shook up the sprint division with an emphatic win over Fly Top Queen and the returning Watts Village in a trial for August’s Asia Cup Challenge race at Seoul Racecourse on Sunday night. While Watts Village, who memorably won the Japan/Korea Interaction Cup at Tokyo Ohi last year, was returning form a 6-month lay-off and was not expected to be at 100%, Fly Top Queen, Korea’s most expensive imported racehorse, had looked in imperious form when dominating over the same 1400M distance a month ago. Fly Top Queen was duly sent off as the odds-on favourite but Wonder Bolt, who had sat in the middle of the pack during the early stages, surged to the front with just over a furlong to go and then produced an unanswerable sprint to win by a full 9-lengths. To compound the disappointment for Fly Top Queen backers, Watts Village got up to edge her into third place. The Asia Challenge Cup is scheduled to be run at Seoul Racecourse on August 31 and is set to involve 3 horses from Singapore and 3 horses from Japan. An encouragingly large number of nominations from Singapore have been received, all of them for horses with ratings in excess of 100. Japan – chastened perhaps after Watts Village’s 100/1 triumph in Tokyo – has also indicated that they plan to send stronger horses than last time, when they won the Seoul leg of the race with Tosen Archer. This means that Korea needs all its A-listers on their game if they are to compete. With Busan horses currently still not eligible to run, the focus has been on Fly Top Queen – and Yeongsan II if connections can be persuaded to take a sporting chance. Wonder Bolt may just have shot to the top of the list. Distances: 9 lengths/1 length – 10 ran. Nobody Catch Me, a 50/1 shot, landed the Stakes race upset of the year to date with a comprehensive 4-length victory in the Busan Metropolitan City Stakes this afternoon. In a race run on wet track after an earlier downpour, Gamdonguibada, the 2012 Grand Prix winner and victor of two big Stakes races already this year was sent off the odds-on favourite. And she looked to be every inch value for that as she set off just behind the early pace-setter, the sprinter Cowboy Son. However, when they arrived in the home-straight, Gamdonguibada, just like when trying to defend her Grand Prix in Seoul last December, had nothing to give, turning her head towards the stands and seemingly going backwards. That left the way free for Nobody Catch Me, Gamdonguibada’s stablemate in the formidable Kim Young Kwan operation, to make a move. Having been just behind the leaders all the way around, jockey Yang Young Nam was now able to take him to the lead. With a furlong to go, it was clear that indeed, nobody was going to catch him. The one that came closest was Peter Wolsley’s Cheonji Bulpae. 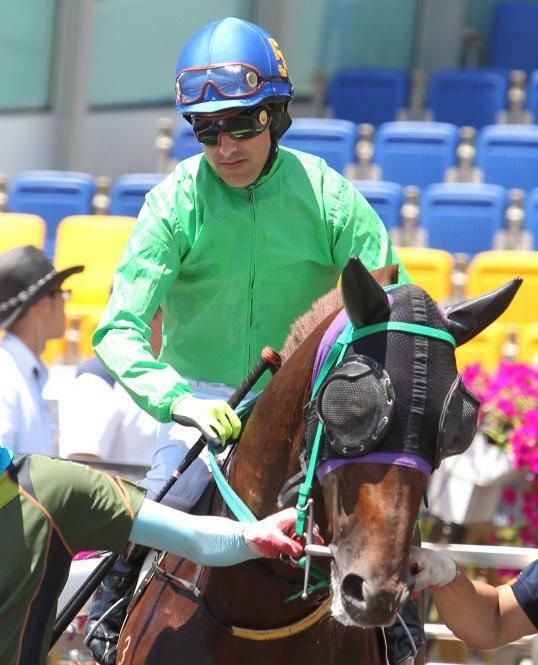 Dead-last as they entered the home straight, jockey Kim Yong Geun weaved his way between horses until he found a clear run and then flew home down the outside of the field. It was a fine run but trainer Wolsley was left to reflect on yet another case of what might have been, just three weeks after his My Winner was also 2nd in the Jeju Governor’s Cup. Cowboy Son stayed on impressively for 3rd, silencing those who had him down as a pure sprinter who wouldn’t be able to last the distance. Heba came in 4th, with Dynamic Jilju picking up the final bit of prize money in 5th. It was another miserable race for Seoul-based runners. 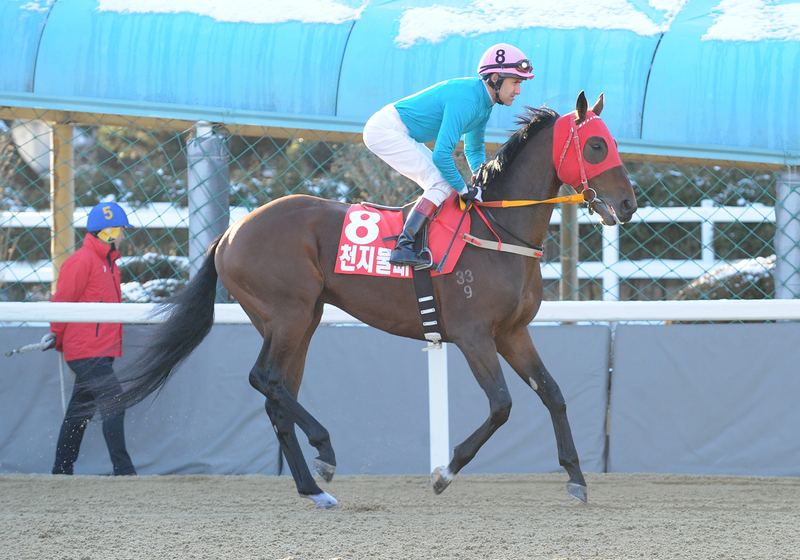 Sangnyu led home the visitors from the capital in an inglorious 6th place, one ahead of Indian Blue whose formidable closing speed never materialised. Nobody Catch Me was a $20,000 purchase at the OBS June sale in Ocala in 2012. Now a 4-year-old gelding, this was his 5th win in 16 starts to date. He’s now won nearly half a million dollars in prize money. For jockey Yang Young Nam, it was a first Stakes win since 2005. For trainer Kim Young Kwan, it was yet another in a seemingly never-ending – or even broken – streak of big race winners. On the backstretch, nobody catches him. The “Summer Grand Prix” is upon us. 15 horses will go to post at Busan on Sunday for what is the fast becoming the most prestigious race of the summer months in Korea, the Busan Metropolitan City Mayor’s Cup. 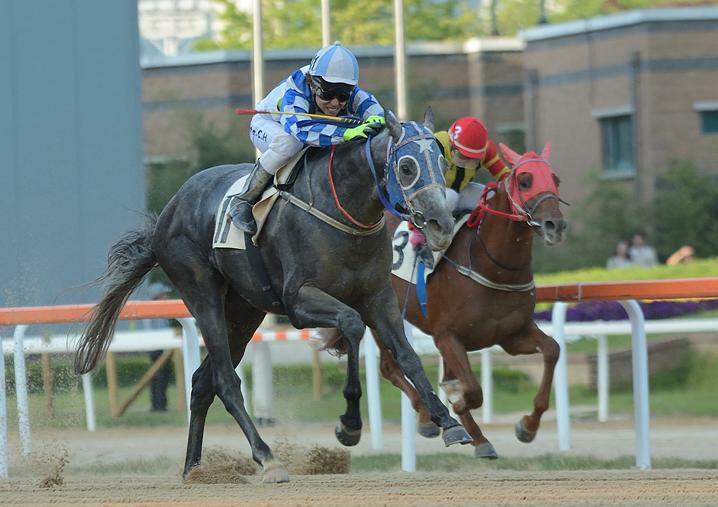 The Cup – known as the Busan Metropolitan for short – has been Open to horses from both Busan and Seoul since 2009 and has been won by such big name horses as Tough Win (twice), Yeonseung Daero and Dangdae Bulpae. There will be a new name in the winner’s circle this year, however. A really good filly, she was 4th in the Grand Prix in Seoul last December but was well beaten behind Gamdonguibada at Busan in the KNN Cup. The fastest closer in the field, if Gamdonguibada and the other front-runners go too quickly, too soon, she could have a chance. She’s won the first two legs of the Queens’ Tour in imperious style in her last two outings and neither facing the makes nor the step back up in distance will hold any fears here. The 2012 Grand Prix winner is a top quality filly. Lost to Heba at this distance in January when giving away 9kg – that shouldn’t happen here. Huge opportunity for Masa Tanaka replacing the injured Joe Fujii in the saddle. Nothing to recommend here. His two wins came on his first two starts two years ago. Has never actually made it to regular class 1 racing and he was 12th in this race last year. Connections clearly enjoy the day out at Busan. A really good-looking 8-length winner last time out at this distance against class 1 horses at odds of nearly 30/1. Unlikely to repeat here but expect him to be challenging for the lead early. Another from Seoul who’s here for the day out. Was a decent prospect at one time but never really recovered form after a 6-moth layoff last year. Has never graduated from class 2 although usually runs in class 1 company and generally doesn’t do very well. No chance. Has two class 1 wins to his name this year and is by no means a bad horse. Likes to come from just off the pace and while he is quick, it’s questionable whether he’ll have enough speed to go past the front-runners here or hold off the likes of Indian Blue late on. Outside chance of a place. The first of two for trainer Peter Wolsley. 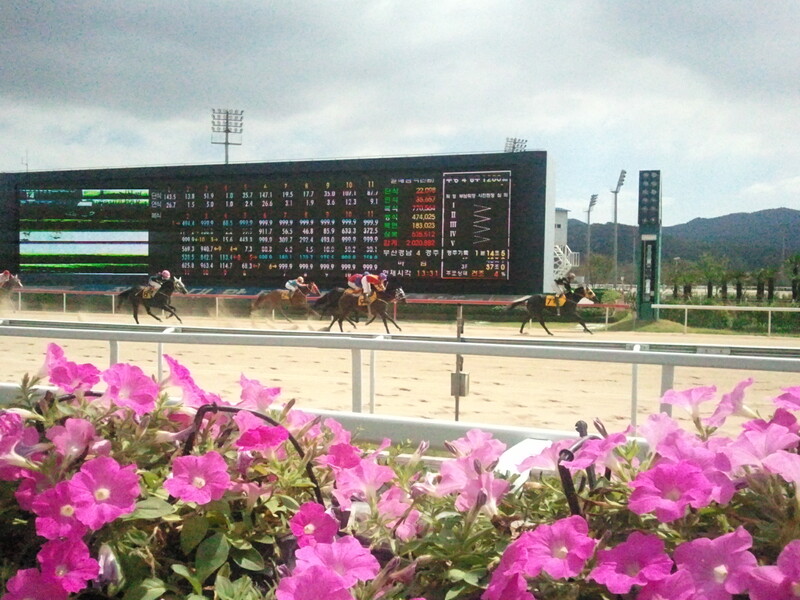 He comes into the race off the back of two consecutive wins at this distance against class 1 Korean bred horses. He’ll face tougher opposition here but is quick enough to compete. Likes to be towards to front early on and then stays on the straight. 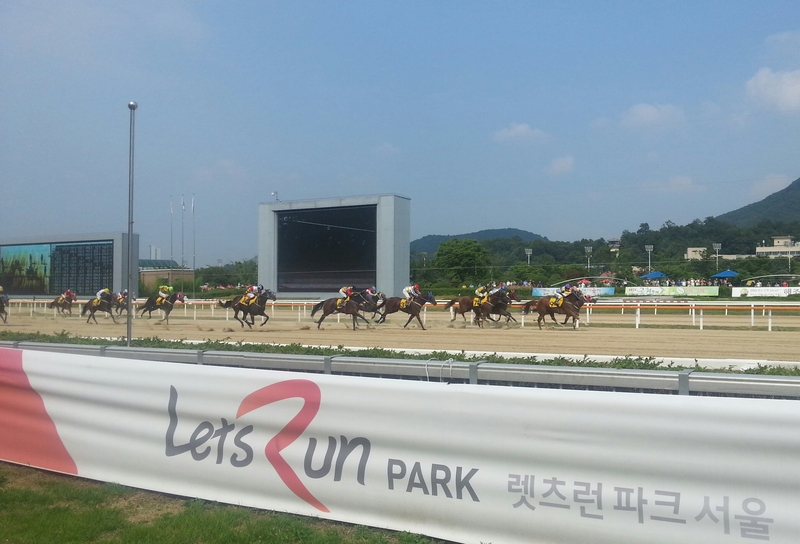 Third behind Gamdonguibada in the KNN Cup last time out and will probably be aiming for a similar finish here. Likely to be close to the pacesetters early on but it is questionable whether she will have enough speed to get past them in the home straight. A Place bet. Hasn’t won in four class 1 starts but has finished in the money on each occasion, second place in the Gukje Sinmun being the highlight. Will expect to challenge for a similar position again. Another who sits just off the lead early on and another who may not be quite quick enough when it counts. Peter Wolsley’s second entrant was 3rd in the Grand Prix last December and then won his first two starts of 2014 before showing up out of sorts in his most recent two. When he wins, it’s from a spot just behind the leaders, generally hitting the front early in the home straight. There will be plenty of competition for that position but on his day, Cheonji Bulpae can compete with this field. Despite his name, trainer Kim Young Kwan’s second entry doesn’t usually lead from the front and then hope no-one catches him. Beaten 7-lengths last time out by resurgent stable-mate Magic Dancer, he still comes in here not without a chance. Tough to see him winning but should be challenging at the business end of the race. The biggest earner to date worldwide for his sire, Cowboy Son is so far only proven up to 1500 metres. He undoubtedly has the fastest sprint in the race but whether he can do that after an extra two and a half furlongs is the big question here. Definitely has class, but will he stay? The dark-horse of the field. The somewhat surprising winner of the KRA Cup Classic last autumn has been in reasonable form this year and comes into the race following a win over 1800 metres last month. Generally comes from off the pace and if he runs to his best, can compete. Scored a win over Gamdonguibada back in January although she had a huge weight advantage that day which she doesn’t have here. Has been in indifferent form since then and will need to step up significantly to compete. Another who will most likely try to come out of the pack as they enter the home straight. 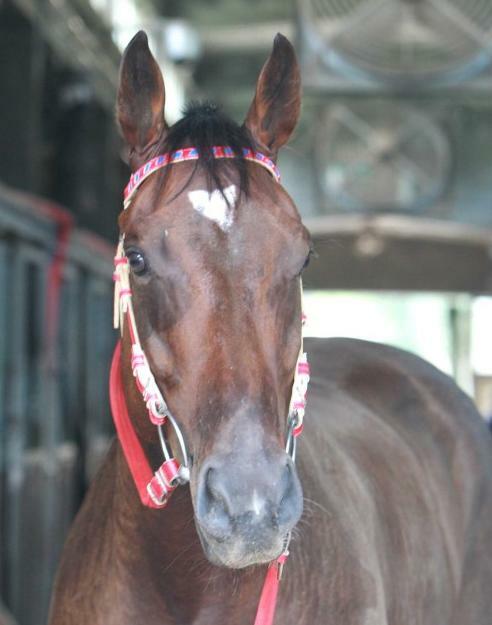 Was 9th on her last start which was at Busan in the KNN Cup. Hasn’t won for a year and while she has a quick finish, it is highly unlikely to be quick enough to trouble the favourites here. Yeongsan made it five wins from five Korean starts, claiming the Munhwa Ilbo Cup in emphatic fashion at Seoul Racecourse on Sunday. The gelding, who was sold to Malaysia as a 2-year-old, only to be re-imported at the end of last year, was sent off as the long odds-on favourite for the 7 furlong race. Under champion jockey Moon Se Young for the first time, Yeongsan was taken to the lead early on and, with minimal promoting from his jockey, accelerated away from the field in the home straight to record one of the easiest Stakes race victories seen at Seoul for a long time. At least since Magic Dancer last month. Or Queen’s Blade the month before. In the entirely separate race for second place, Sun Gear got the better of Clean Up Speed, a full 12-lengths behind the winner. 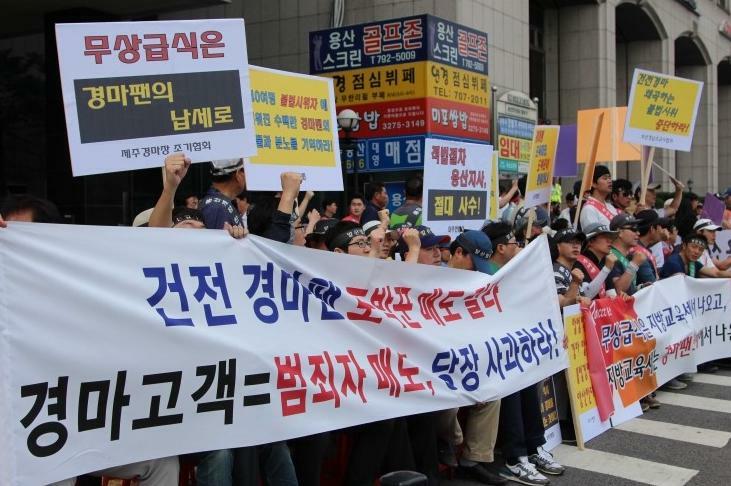 Yeongsan is yet to be tested in Korea. He didn’t especially impress on the turf in Malaysia where he scored one 2nd place from two total starts, but has taken to the Seoul sand exceptionally well and is, at least until this year’s 2-year-old crop start proving their worth, currently the most exciting horse on the peninsula. 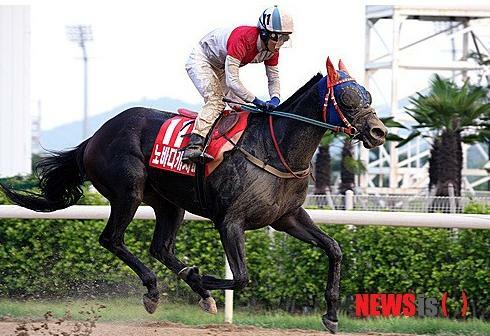 Yeongsan II [Menifee – Foxxy Cleo (Peintre Celebre)] (he has to officially be named “II” due to a previous “Yeongsan”), has now won 5 races at distances between 1200 metres and 1700 metres all by wide margins and without facing any challenge. Still officially at class 2, at least for one more race, it may still be a while before we see what he is capable of. It’s wise not to be carried away as we’ve been here before with the likes of Feel So Good and Fly Top Queen. While the latter has turn out to be a very good horse, she hasn’t been quite the international class race she looked early on. Where Yeongsan goes next is the big question. In an ideal world, he would be taking on the visitors from Japan and Singapore in the SBS Asia Challenge Cup at the end of August over the same distance. Darryll Holland has returned to the UK after a successful 16 month stint in Korea. The British jockey racked up 66 winners from 350 rides in his time here, which puts him in 6th place in the all-time list of foreign jockeys to ride in Korea. A few eyebrows were raised when Holland – a winner of numerous big races worldwide – arrived and many predicted that he would, like so many others before him, either leave quickly or at the very latest, quietly after his initial contract was up. To the pleasant surprise of the racing community – not to mention the delight of punters – he not only saw out his contract but renewed it twice. Holland adapted well to life in Busan and while he experienced the similar frustrations to many foreign riders who come here, he embraced the local culture and got down to some serious hard work. Of course, the thing that overcomes all in racing is winners and he rode plenty of them. It started on his debut day when he rode two winners and he never looked back. Riding for all of the top trainers here, including Busan’s main man Kim Young Kwan, he formed a particularly strong partnership with Australian trainer Peter Wolsley which saw them win the Gold Circle Trophy together with My Winner and culminated in a memorable Friday in January this year when they combined for four winners on a single afternoon. Although they went their separate ways before the end of his time here, the Wolsley/Holland combination is one that will live long in punters’ memories. He didn’t always see eye-to eye with the Stewards, feeling were overly keen to penalize what he termed “competitive race riding” – something that top local riders Mooon Se Young and Seo Seung Un, who try to ride in a similar way also complain of. Regardless, the Korea Racing Authority were as happy with him as punters were and made clear that he is welcome back at any time and supplying him with a glowing reference on departure. 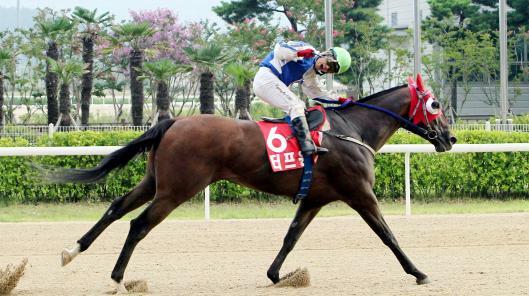 Holland’s last ride in Korea was due to be on Indie Band in the Jeju Governor’s Cup at Seoul on June 29 but sadly Korea’s best colt fractured a leg in the build-up to the race. That meant his last ride was at Busan on June 22. It was, of course, a winner.